Got that need for speed? In this tutorial, we’ll show you how to throw a fastball in baseball. The name “fastball” is pretty self-explanatory! Essentially, a fastball is a straight pitch with tons of pace. You’re aiming to beat the batter with speed to try and strike him out. Notice how the batter isn’t able to complete his swing before the ball reaches the catcher’s mitt. The four-seam fastball, which is faster and more accurate. The two-seam fastball, which is less predictable. It can move in the air, much like a splitter or a knuckleball. To determine which type of fastball you’ll be throwing, you’ll need to change your grip rather than your pitching technique. When throwing a four-seam fastball, you want your fingers to be perpendicular to the seams. 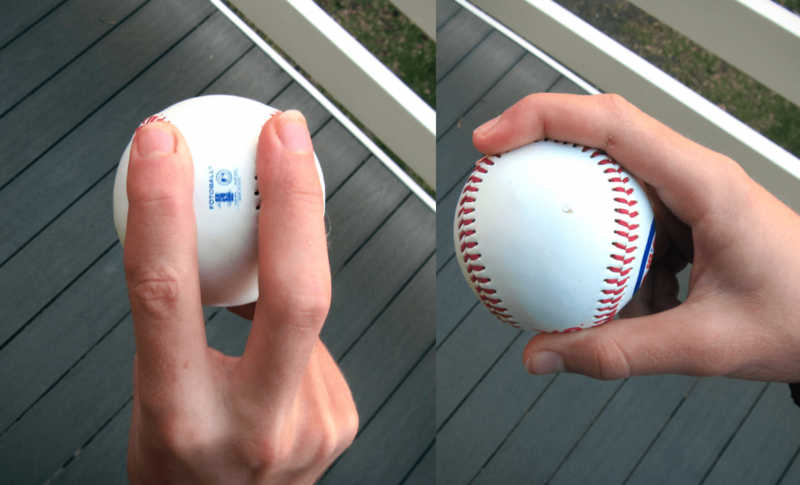 Use two fingers at the top, and rest them on the seam that forms one of the loops on the ball (as shown). Your thumb should support the bottom of the ball, a little behind your index and middle finger. 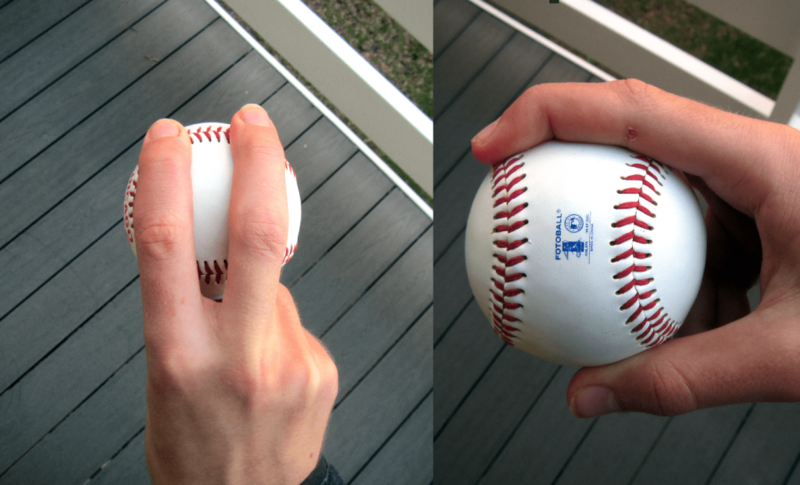 For a two-seam fastball, you want your fingers parallel to the seams. Like with a four-seam grip, use your first two fingers and your thumb to hold the ball. However, with a two-seamer, you want your top two fingers to rest on the narrow part of the seam (where it curves in). You should hold a two-seam fastball a bit further back in your hand than you would a four-seamer, to give the ball greater chance to move around in the air. However, both balls should be held fairly loose. Decide how you’re going to be holding the ball. Once you’ve got your grip right, hide the ball with your glove so that the batter can’t see it. 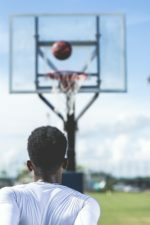 Once you’re ready to throw, place your back foot (normally your strong foot – your right foot if you’re right-footed) on the rubber, standing side on to the batter. Take a large stride towards the batter with your forward foot. As you’re doing this, take your strong hand out of the glove (keeping the ball gripped properly) and begin to throw the ball. When throwing, look at the catcher’s glove. 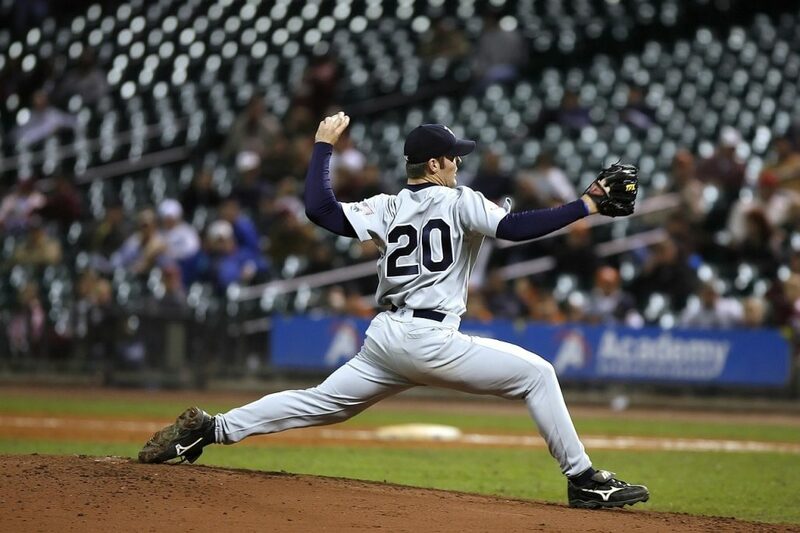 Ensure your elbow on your throwing arm is above your corresponding shoulder (right elbow above your right shoulder if you’re throwing with your right hand). Release the ball when your hand is in front of your body. Bring your hand across your opposite knee after throwing. This can help to reduce your chances of elbow/shoulder injury, as it allows your entire body to absorb the force of the throw rather than just your arm. When first learning the fastball, try and throw at about 60% power – accuracy is more important than pace at this stage. Once you get the technique down, you can begin to ramp up your speed. As with most things in sport, practice makes perfect. Remember, master the accuracy rather than the speed of your pitch first – there’s no point throwing at 90mph if they’re all balls! Problem #1: I can’t hit the catcher’s glove! Solution: ensure your hand is facing the home plate as you release the ball. If your fingers aren’t behind the ball, the pitch will likely deviate to one side or another. In addition, make sure you keep your eyes on the glove as you release the ball. Problem #2: my fastball isn’t fast! Solution: if you’ve got the basic technique down and can throw accurately, but can’t pitch with pace, it might be worth doing some gym work. Focus on building up your forearms and triceps, but also work on your core strength – a lot of the pace in a throw comes from your actual body rather than just your arms. Problem #3: I can’t get much backspin on my throw – it’s too easy to hit or goes too low. Solution: hold the ball really softly, as if it were an egg. This allows the ball to leave your hand more gradually, helping you to induce backspin. Also, make sure you’ve got your grip right. Throw with a four-seam grip if you’re struggling. Problem #4: I can throw well in training, but not in games. Solution: make sure you’re pitching at a real batter in practice, so you can overcome your fear of hitting them. There are two other possible reasons you might not throw well in-game. You’re fatigued. Do some really intensive throwing drills that involve other exercise. For example, throw five balls in quick succession, then run through all four bases. Repeat two or three times and then have a rest. You’re nervous. Make some drills with some sort of consequence for throwing poorly. For instance, if you don’t throw a legal ball, you have to run to the dugout and back. Keep doing this until you get five, ten or fifteen perfect pitches in a row, depending on how good you are. This can help you to learn how to deal with pressure.